We now offer pickup and delivery service to areas in Southlake, Texas, and we’re excited! Our service will start with the Foxborough and Diamond Oaks ares of Southlake. As you can see by the map, our service area will be East of Whites Chapel, West of North Carroll, North of Southlake Blvd. and South of the 114. 24 Hour Drop-off ……. to better serve you! 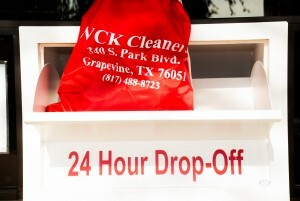 For your convenience, we offer after-hours drop-off for your laundry and dry cleaning. If you prefer this option, all you need to do when you drop off your items, at our store in Grapevine, is to write, and sign, a note letting us know who you are and how we can contact you. Grapevine, Texas, WCK Cleaner’s frequently asked questions we are sure date back to the days of Pompeii when early cleaners were asked a number of questions regarding the care and cleaning of robes and…. Well, maybe just robes (This is all speculation on our part, but it must be true.) What was interesting was at the time they used lye and ammonia in early laundering and a type of clay called “fuller’s earth” to absorb soils and greases from clothing too delicate for laundering. 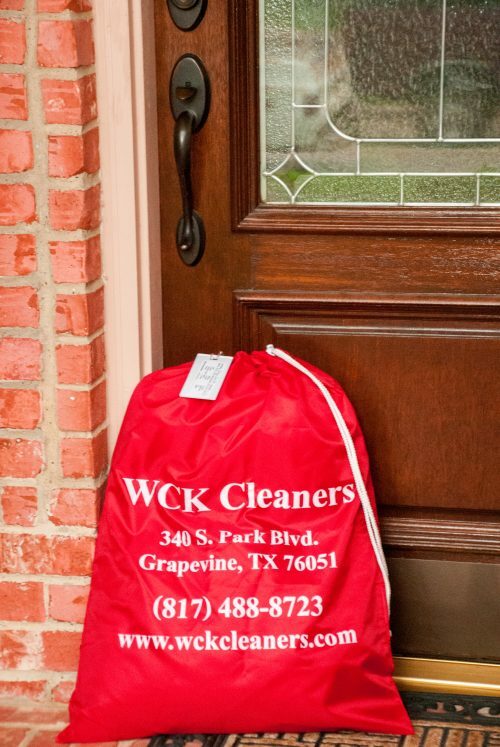 We are sure the most often asked question has been… “Why does my skin burn when I wear my red robe?” WCK Cleaners is proud to say that we are a “Green Dry Cleaner”. Yes, we do still Iron Shirts with a steam iron. With all the up-to-date equipment we have there are occasions that we still need to use a hand held steam iron to get the wrinkles out. So we got to thinking about the what going to happen this New Year’s Day when we are closed and your hand iron gets clogged. The following are helpful hints we thought about. To clean the inside of an iron, fill the iron half full with water. Add vinegar to the hot water until it reaches the fill line of the water reservoir. This will soak out the deposits in your iron. Run the iron on hot for 15 minutes and then allow to cool for one hour. Drain the iron of the water-vinegar mixture. Important, or you will have clothes smelling like a pickle… ? Add water to the iron and repeat the previous steps, but do not use vinegar, just plain water. Drain the iron of the water and it is ready to use. According to Hover’s website, ”Burned on starch comes off by rubbing the sole plate with a wet Mr. Clean (R) Magic Eraser. Make sure the iron is cool so you don’t burn yourself. If the plastic has been melted on your NON-STICK sole plate, it can be removed. Place a piece of aluminum foil on the ironing board and sprinkle it with salt. Ironing over the salt and foil will help loosen the plastic. Never try to scrape the plastic off with metal tools. It may permanently damage the sole plate. We are located in Grapevine, Texas and offer a full range of Dry Cleaning and Laundry services. We pride ourselves in the fact that we are “environmentally friendly” and that our equipment is state of the art.